Hot Rize has been astounding the bluegrass world with their fresh, contemporary approach to traditional music ever since their formation in 1978. The band’s unique and progressive style of bluegrass, powerful original songs, tight-as-a-drum ensemble playing, and dynamic stage show quickly made them stars on the major festival circuit and far beyond. 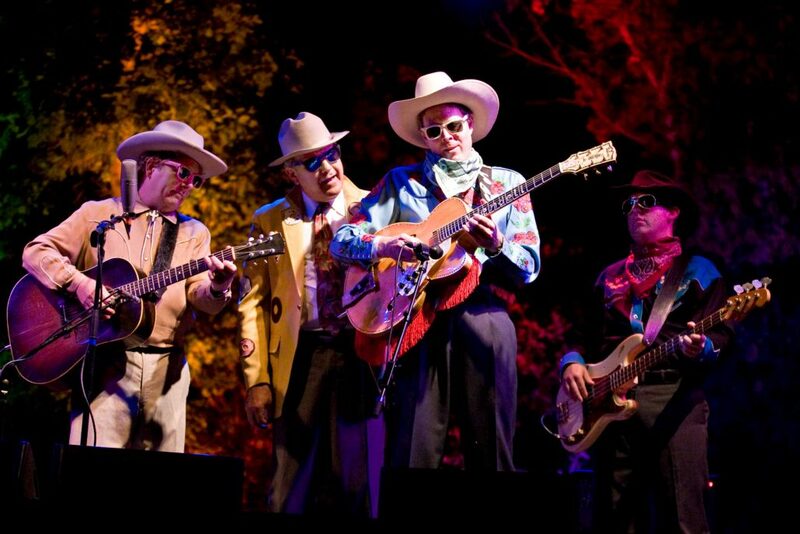 In 1990, Hot Rize won the first-ever International Bluegrass Association’s Entertainer of the Year Award and in 1991 they picked up a Grammy nomination for Best Bluegrass album and won IBMA Song of the Year. Since the 90s, this all-star band has kept their legend alive by performing at only the most prestigious festivals (like Hardly Strictly Bluegrass​, Telluride​, Bonnaroo​, and GreyFox​) and a few select venues. This crazy thing happens when you hire Hot Rize – everywhere they go, the ever-popular Red Knuckles & The Trailblazers shows up as well. Invited or not, at some point during the night, they are going to take the stage and wow the crowd with their classic honky tonk and western music. The combination of these two bands (who bear some resemblance) makes this one world-class evening of entertainment, a rare event not to be missed.